You’ve been invited to a Holiday office party and you find yourself standing in your closet asking yourself, ‘What am I going to wear tonight?‘ Between decorating the house for the holidays, working, taking care of the family, gift buying and possibly throwing your own parties – life is busy and our holiday party attire can be forgotten. 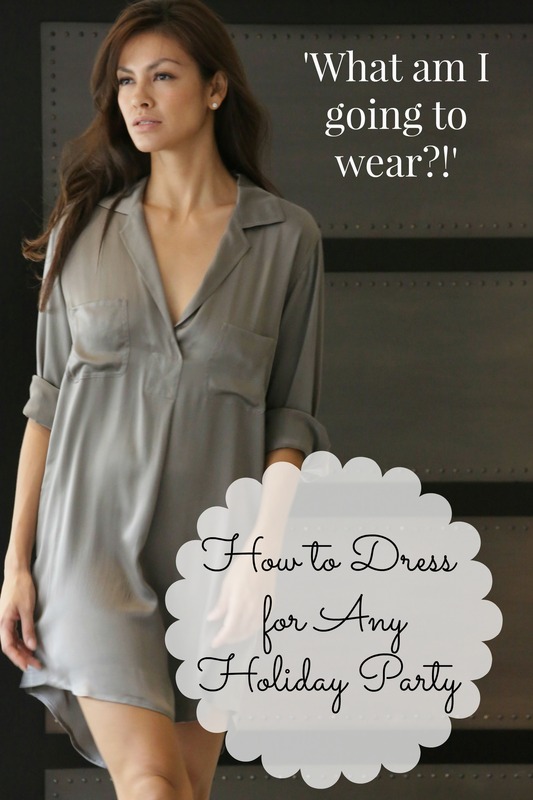 Not only that, but it can be confusing to know what to wear to all of the different kinds of parties we’re invited to. But no worries! Luxury resort and ready-to-wear designer Marie France Van Damme shares her dressing tips for every kind of holiday party for Mom Fabulous readers. Whether it’s your office party or your significant other’s, she has the tips you need. Even though it’s the holidays, you want to remain office-appropriate, but still show off your personal style. Steer away from low-cut tops and short skirts—don’t wear anything that you would never wear to the office, but have fun and get a little more dressed up than you normally would! Don’t be afraid of a little sparkle—show off that sequined dress that’s been hiding in your closet! If you’re hosting a party, it’s especially important to be comfortable. Luxury and comfort should go hand-in-hand. You don’t need to be uncomfortable to look great. Wear something you can move around in- you want to feel like a more confident version of yourself to entertain, and you definitely don’t want to be tugging and pulling at your clothes all night while you’re preparing dinner or catching up with your relatives. Dressing for your significant other’s office party should be similar to dressing for your own, except a little caution can go a long way. Make sure you know what their office environment is like. Will people be wearing jeans or will everyone wear suits and gowns? Nothing is wrong with jeans for every day wear, but not to go to a holiday party. When in doubt, it’s always better to be overdressed. For your first time meeting your significant other’s family, it’s important to make a good first impression by looking as polished as possible. While you still want to feel like yourself, you don’t want to go for the shock-factor by wearing crazy jewelry and makeup. Keep it simple and chic with a sleek black dress, understated makeup, and a few pieces of your favorite jewelry to show off your personality. This would be the time to really show off your personal style. Just be sure to not go overboard—let one feature stand out. This goes for your clothes as well as your makeup and hair. If you want to show off your legs, cover up a bit on top. For makeup, go for a bold lip and keep the rest simple.